Scooby and Gang Encounter a Real Haunting! This feature length adventure has Scooby, Shaggy, Daphne, Freddie, and Velma investigating a haunted isle deep in a Louisiana bayou. Laughs and Scares in equal measure as the Mystery Inc. crew finally come across ghosts who aren't just crooks in masks! This is definitely Scary. For young children this movie is way too scary and my kids don't freak to easily. I can see how others like it. But becareful how you intriduce it to your child. The best Scooby Doo yet! Ever since I was a toddler, Scooby Doo has always been one of my favorite cartoons to watch. "Scooby-Doo on Zombie Island" is the first Scooby Doo movie I saw and I was pretty satisfied with it. Scooby-Doo and the gang are up to some of their usual things, and even taking on some new challenges. Scooby-Doo and Shaggy still eat every chance they get, the gang still drives the Mystery Machine, and they're still hunting ghosts no matter how scared Scooby or Shaggy get at the site of seeing a ghost. Scooby-Doo, Shaggy, Daphne, Fred, and Velma all travel to a woman's house after she claims she lives in a real haunted house. They all soon find out that she's right, her house is haunted. Dead ghosts arise and form themselves into zombies. 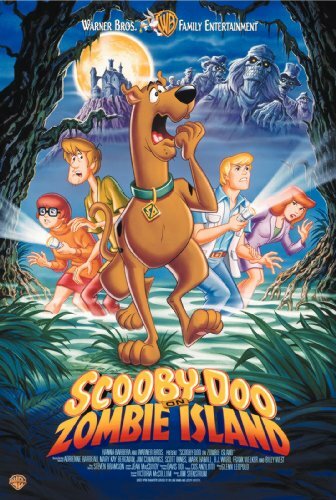 The biggest difference about "Scooby-Doo on Zombie Island" when compared to the cartoon series is that in this movie, the zombies are real, no masks this time around, and I thought that that was a nice twist. I must admit that the first time I watched Zombie Island it was with low expectations. I am 34 years old and like most people my age we grew up watching Scooby Doo on Saturday morning. My wife and I first purchased the "classic" Scooby Doo series for our 3 year old son. He really enjoys watching them over and over and over again!! I must also admit that my wife and I also enjoy the classic episodes. We purchased Zombie Island about a month ago and he likes it as much or more than the classics. I was skeptical at first as I previously stated. How could a new version of Scooby Doo measure up to the classic ones?? Especially without the original voices and annimation..
Zombie Island does justice to the original series. The characters, although very 90s' are still very much the same as the ones in the classics. They actually wear different outfits-with the exception of Shaggy (Velma does have different shoes and socks!) The Mystery Machine is updated with computers ect. Even the Scooby Doo song is done in a very 90s' way. Not to mention, the animation is much better in Zombie Island than the classics. A true example of "the more things change-the more they stay the same" True, Scooby Doo is "updated" but it hasn't "changed"
Scooby's Ultimate Movie, But Beware. ALERT!!!!!!!! this isn't for young children!!!! this is not a movie for kids! it has real monsters (i know the box tells you that but the art of the film is very grapic and the story is very much ment for adults) so be sure you watch this movie before you show it to kids. is this really appropriate for kids? A Feature for Adults Who Remember the Original Series. I've been watching Scooby-Doo for more than 20 years, it's one of my favorite cartoon shows, when it was really a good show, before that stupid Scrappy came into the show. Anyway, the Scooby-Doo on Zombie Island is one of my favorite movies. When they decide to get back the Scooby show again and the movies, this was the first one, back in 1999. Like I said, for me is the best one. I like the new look on the characters, the story, everything. If I were going to end the Scooby-Doo show (and the movies) forever, this should have been the last movie or last episode of the show. I mean, it's been a couple of years since the gang were split, and they reunite for like a one last mystery and the cool thing is that this time, the monsters are real. Some people didn't like that, but that's the cool part of the movie. Not quite the same ole Scooby Doo, and very scary! Also, it takes a fresh and exciting turn into the ghosts and the supernatural of New Orleans, when the team comes back to try and pursue real ghosts/monsters for Daphne's TV show, they run into a pretty young thing that strikes up interest in Fred (voiced by Tara Charendoff-Strong, who plays Gwen in the two "Sabrina" movies), who says that her boss's mansion is haunted and invites them over to investigate, which leads into unexpecting and scary stuff. What makes this movie and its sequels exciting is their turn into supernatural/ghosts that is real, not people in suits (some people and kids will be disappointed by this). Also, the animation is more bold and colorful. Lastly and mostly, the actors who voice them breathe fresh life and brings them from the '70s into the '90s-2000's. What I can say about this is that demanding Scooby-Doo fans can stay away, if they expect bad guys in suits and masks. If fans of it expect a plot twist and REAL scary stuff, then this is for you. I loved this movie, and thought it was one of the best Scooby Doo videos I've ever seen. There's action, laughs, and even some romance. I love it when there are a lot of hints of Daphne/Fred, and there are quite a few in this movie. The music is really good too. One of the great things about this movie is the characters aren't running around aimlessly, not that there is anything wrong with any of the Scooby Doo episodes (I loved them too). There is a real, exciting plot. After an absence of 7 years, Warner Brothers jumpstarted Scooby-Doo's career with a line of direct-to-home movies. "Scooby Doo on Zombie Island" was the first, and best of these movies. The story starts with the Mystery Inc members living their own lives after they split up. Daphne, now a successful TV show host, is hosting a new show featuring haunted houses of America. Fred, as her producer, uses this as an opportunity to bring the gang back together. Shaggy and Scooby, fired from their recent post as airport security guards, and Velma, the owner of a mystery bookstore, agree. Their first show segment takes them to New Orleans where they meet Lena Dupree, a housemaid working at an estate on Moonscar Island. She claims that the house is haunted by the ghost of Morgan Moonscar, a pirate who terrorized the bayous a couple of centuries back. will they be able to solve the mystery? Will the ghost be real or just another guy in a costume? This review will ruin the mystery so do not read it if you don't want to know. This was a really cool update of the classic Scooby Doo formula. The gang have new clothes, new jobs and new voices. The movie is self-aware but not to the point that it becomes really annoying. The animation is also much better and not so cheap looking. There are shadows, out of focus backgrounds and 3-dimensional shots. Also, the same background does not repeat itself over and over when Shaggy and Scooby are running. The plot is about a haunted mansion in a Louisiana bayou and the Mystery Inc. effort to unravel it. But the gang have split up. Daphne Blake is a talk show host, Fred is her producer, Velma Dinkly is a bookstore owner and Shaggy and Scooby are...unemployed. They reunite to go on the road for Daphne's birthday. That is when they come across an opportunity to solve a REAL mystery. Much to the disappointment of Fred the zombies are real. There are no fake masks and no scams. I think this is very refreshing. The new, re-vamped Scooby Doo franchise is full of potential and this movie along with, "Scooby Doo and the Witches Ghost" and "Scooby Doo and the Alien Invaders" uses that potential very well. If only they were longer. Just over 70 minutes ain't enough. Bad movie for young kids!!!!!!!!!!!!!!!!!! Lots of fun -- Know your kids! The Best Scooby-Doo I've Ever Seen! Please don't read if you don't even want a hint of spoilers. This movie was remarkable in that the gang finally had a true supernatural mystery with no fakes in it whatsoever. It was actually very funny in how Fred insisted there MUST be a fake somewhere! The updates to the characters were neat as well; it's still the same old gang, but we finally see some growth. This one, I agree, kids under at least 5 shouldn't watch. Daphne and Fred put out a zombie head...it's a bit scary, ya know. But it's still perfect! Perfect soundtrack, and story, and animation also is very good!! I like "Scooby-Doo on Zombie Island" because of the fact that the group has split up and gone their seperate ways in the beginning. It's kinda neat that they took up where they left off. The film is pretty interesting with all the usual suspects, but with a twist plot. Even though the monsters may be real, there's still a mystery afoot. The only downside is that they don't have any "logical explanation" for anything, unlike the old Scooby-Doo episodes. I guess that making the monsters real allows the film to become more flexible. As for scariness, my brothers watch this film a LOT and they weren't scared one bit! Mind you, one of them is only FOUR! My four year old got into watching the Scooby reruns and we saw the movie together. While he was slightly frightened at certain points in the movie, he was more upset during Toy Story 2. Scobby Doo is back and scared than ever. Scooby Doo makes a comeback from his 3 films in the late 80's. And this time they added Scooby Doo Where Are You? But the movie is short. The first 3 was between 90-95 minutes long. But it seems that that it got cut down short. The movie clocks at about 77 minutes. Scooby Doo and Shaggy star in this you must love to watch me eat movie. This time there is no Scrappy Doo. But the whole gang is here. But they have broken up because the monstars/ghosts are bad guys in maskes. Daphne has her own show while Fred runs it. Velma opened her own mystery bookstore, and Scooby and Shaggy has both gotten jobs at the same airport. But get fired when thier boss catchs them not working. A few seconds later Shaggy gets a phone call from Fred. Shaggy cliams that Scooby and him was just thinking of taking some time off. Fred is inviting Shaggy and Scooby along for the ride to find a real haunted house for Daphne's viewers. The show is entering its second season. Fred aslo invited Velma along too. And she was saving a box of Scooby Snacks for a long time. But now they are no good. Daphne wishes to find a real haunted house. She is tired of finding fake ghosts. And just so happens that she gets her wish. A young woman was listening in on the talking and decides to show them her bosses haunted house. Shaggy and Scooby are off eating at the time. (of course). Her name is Lena. And her bosses name is Simone. But Simone doesn't like dogs. So she has cats. Lots of cats. How does Simone keep track of them? I have two preschoolers who LOVE Scooby Doo (as I did when the shows were 1st run). I mistakenly got this tape, thinking it couldn't be bad. This is MUCH less funny and more graphic than the original series. There is no carefree mood in this movie that I could find. This Scooby Doo video is much too scary for kids under 10 or so: the zombies are truly frightening, a la Night of the Living Dead, and both they and the cat monsters in the story turn out to be _real_ -- very different from most Scooby Doo stories where the monster turns out to be a regular human in disguise. There's a scene where Fred tries to pull a zombie's "mask" off and ends up pulling off the creature's head -- in a kids' video?? What were the video makers thinking?! In this new movie it is the 90's. The whole gang are grown up with their own careers. Daphne is a reporter who has her own talk show. Freddie is a writer who produces her show, they are also dating. Velma owns a mystery bookstore. Shaggy is still exploring his career path. Scooby Doo still likes eating those scooby snacks. They take the mystery machine to New Orleans to find a real haunted house on a mysterious Bayou. They find that the ghosts and Zombies haunting the island are real! They must solve the mystery of Zombie Island.